Dynamical systems theory is an area of mathematics used to describe the behavior of the complex dynamical systems, usually by employing differential equations or difference equations. When differential equations are employed, the theory is called continuous dynamical systems. From a physical point of view, continuous dynamical systems is a generalization of classical mechanics, a generalization where the equations of motion are postulated directly and are not constrained to be Euler–Lagrange equations of a least action principle. When difference equations are employed, the theory is called discrete dynamical systems. When the time variable runs over a set that is discrete over some intervals and continuous over other intervals or is any arbitrary time-set such as a cantor set, one gets dynamic equations on time scales. Some situations may also be modeled by mixed operators, such as differential-difference equations. System dynamics is an approach to understanding the behaviour of systems over time. It deals with internal feedback loops and time delays that affect the behaviour and state of the entire system. What makes using system dynamics different from other approaches to studying systems is the use of feedback loops and stocks and flows. These elements help describe how even seemingly simple systems display baffling nonlinearity. In human development, dynamical systems theory has been used to enhance and simplify Erik Erikson's eight stages of psychosocial development and offers a standard method of examining the universal pattern of human development. This method is based on the self-organizing and fractal properties of the Fibonacci sequence. Using mathematical modeling, a natural progression of human development with eight life stages has been identified: early infancy (0–2 years), toddler (2–4 years), early childhood (4–7 years), middle childhood (7–11 years), adolescence (11–18 years), young adulthood (18–29 years), middle adulthood (29–48 years), and older adulthood (48–78+ years). According to this model, stage transitions between age intervals represent self-organization processes at multiple levels (e.g., molecules, genes, cell, organ, organ system, organism, behavior, and environment). For example, at the stage transition from adolescence to young adulthood, and after reaching the critical point of 18 years of age (young adulthood), a peak in testosterone is observed in males and the period of optimal fertility begins in females. Similarly, at age 30 optimal fertility begins to decline in females, and at the stage transition from middle adulthood to older adulthood at 48 years, the average age of onset of menopause occurs. These events are physical bioattractors of aging from the perspective of Fibonacci mathematical modeling and dynamically systems theory. In practical terms, prediction in human development becomes possible in the same statistical sense in which the average temperature or precipitation at different times of the year can be used for weather forecasting. Each of the predetermined stages of human development follows an optimal epigenetic biological pattern. This phenomenon can be explained by the occurrence of Fibonacci numbers in biological DNA and self-organizing properties of the Fibonacci numbers that converge on the golden ratio. ^ Grebogi, C.; Ott, E.; Yorke, J. (1987). 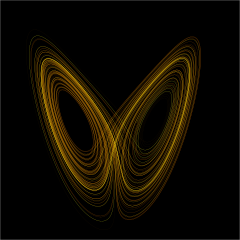 "Chaos, Strange Attractors, and Fractal Basin Boundaries in Nonlinear Dynamics". Science. 238 (4827): 632–638. doi:10.1126/science.238.4827.632. JSTOR 1700479. ^ a b Sacco, R.G. (2013). "Re-envisaging the eight developmental stages of Erik Erikson: The Fibonacci Life-Chart Method (FLCM)". Journal of Educational and Developmental Psychology. 3 (1): 140–146. doi:10.5539/jedp.v3n1p140. ^ Kelsey, T. W. (2014). "A validated age-related normative model for male total testosterone shows increasing variance but no decline after age 40 years". PLoS One. 9 (10): e109346. doi:10.1371/journal.pone.0109346. ^ Tulandi, T. (2004). Preservation of fertility. Taylor & Francis. pp. 1–20. ^ a b Blanchflower, D. G. (2008). "Is well-being U-shaped over the life cycle?". Social Science & Medicine. 66 (8): 1733–1749. CiteSeerX 10.1.1.63.5221. doi:10.1016/j.socscimed.2008.01.030. PMID 18316146. ^ Perez, J. C. (2010). (2010). "Codon populations in single-stranded whole human genome DNA are fractal and fine-tuned by the Golden Ratio 1.618". Interdisciplinary Sciences: Computational Life Sciences. 2 (3): 228–240. doi:10.1007/s12539-010-0022-0. PMID 20658335. ^ Paul S Glazier, Keith Davids, Roger M Bartlett (2003). "DYNAMICAL SYSTEMS THEORY: a Relevant Framework for Performance-Oriented Sports Biomechanics Research". in: Sportscience 7. Accessed 2008-05-08. ^ Lewis, Mark D. (2000-02-25). "The Promise of Dynamic Systems Approaches for an Integrated Account of Human Development" (PDF). Child Development. 71 (1): 36–43. CiteSeerX 10.1.1.72.3668. doi:10.1111/1467-8624.00116. PMID 10836556. Retrieved 2008-04-04. ^ Smith, Linda B.; Esther Thelen (2003-07-30). "Development as a dynamic system" (PDF). Trends in Cognitive Sciences. 7 (8): 343–8. CiteSeerX 10.1.1.294.2037. doi:10.1016/S1364-6613(03)00156-6. PMID 12907229. Retrieved 2008-04-04. ^ "Chaos/Complexity Science and Second Language Acquisition". Applied Linguistics. 1997.